Early start around 5-6pm till 8-9pm. Onstage 5pm for “Hard Day’s Night Live” special Beatles day. OK folks here we go… all down to Dingwalls on Dec 3rd! The Xmas show will feature a full Wilburys set including all the classics (Handle With Care, End of the Line, She’s My Baby plus Beatles & solo George etc), along with a special tribute set to the late, great “Big O”, Roy Orbison who left the bandstand exactly 25 years ago on December 6th, 1988. Plus special guest tbc. Wilburys & Quarrymen Unite for Historic Gig! On Monday May 6th, an historic musical event took place at London’s St. James’ Theatre, when three members of John Lennon’s original Quarrymen (Rod Davis, Len Garry and John ‘Duff’ Lowe) were joined by two of the Trembling Wilburys, drummer Dave Stark and bassist Marko Laver, for a one-off gig which was rapturously received by a full house crowd. Dave and Marko were invited to step in as regular Quarrymen drummer Colin Hanton was recovering from a shoulder operation back home in Liverpool. The two-set gig included many skiffle and rock’n’roll classics such as ‘Rock Island Line’, ‘Twenty Flight Rock’ and ‘That’ll Be The Day’, along with Quarrymen/early Beatles originals ‘One After 909’ and ‘In Spite Of The Danger’, plus a sentimental version of Lennon’s classic ‘In My Life’. 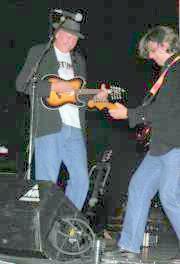 Click here for a full report of the show at The Quarrymen website. Three of the original Quarrymen – Len Garry, Colin Hanton and Rod Davis. On Monday, the 6th of May, an historic event will be taking place. John Lennon’s original band, the Quarrymen will be performing at St. James’ Theatre, London. Three members of the original Quarrymen will be joined by our own drummer, David Stark, and bass player, Marko Laver for a one off gig. The Quarrymen perform the Skiffle and early Rock music, which influenced the birth of the Beatles, including songs like“Rock Island Line”, “Mean Woman Blues”, “Whole Lotta Shakin’”, “Blue Suede Shoes”, “Lost John”, and many more. As well as their music, the Quarrymen share their Liverpool sense of humour in the stories and anecdotes with which they pepper their performance, giving Beatles fans a unique insight into the origins of their favourite group and the city in which they grew up. 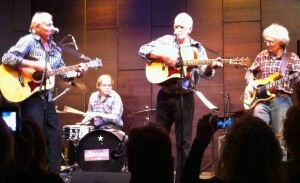 The current Quarrymen lineup includes three of those five original musicians, – Len Garry, former tea-chest bass player, now playing guitar and replacing Lennon as lead singer, – Rod Davis, from Quarry Bank School, on guitar and Colin Hanton on drums, who played with John, Paul, George and John Duff Lowe on the famous Percy Phillips recording session which produced “In Spite of All the Danger” and “That’ll Be the Day”. For more information and tickets, please visit the St. James Theatre website by clicking here. 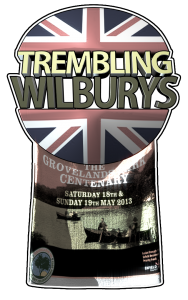 The Trembling Wilburys will be playing at the Grovelands Park Centenary, which takes place in Winchmore Hill on May the 18th and 19th. It promises to be a wonderful event full of great activities and shows. 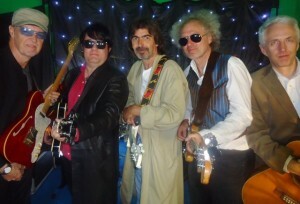 The Wilburys will be performing on the main stage on the Saturday at around 4pm with a combination of Traveling Wilburys, Roy Orbison (our Dave Collison) and George Harrison (our Glen Knowler) songs for you all to dance and sing along to. 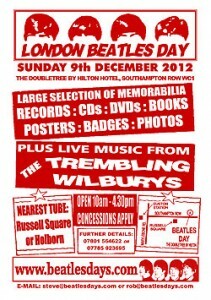 So, come on down and enjoy the beautiful park, all the events and our very own Trembling Wilburys. 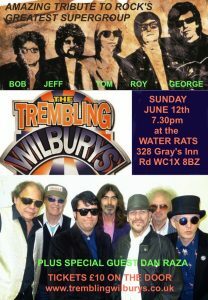 Don’t forget to head on over and like the Trembling Wilburys facebook page and maybe even send invites to your facebook friends. 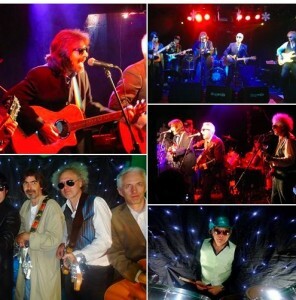 This Saint Patrick’s Day, March 17th 2013, the Trembling Wilburys will be playing at a lunch to celebrate the unveiling of plaques for George Harrison MBE and John Lennon MBE. All of the usual Wilburys hits plus a few extra ‘George’ numbers, with our very own Glen Knowler, will get the day rocking. Tickets to this event will cost £80 including wine on the table. It’s Christmas time again, folks. And we’re re-visiting our spiritual home, the Castle Rocks! Come down and join us to ring in Christmas and the New Year at Denis’s place. We’ll be doing all your favourite Orbison, Harrison and Wilburys tunes. We had a lovely welcome last time and, by all accounts, everyone enjoyed the show. So come on down! 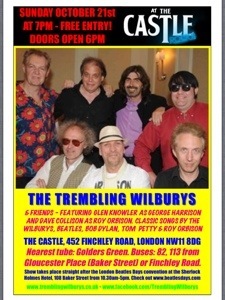 The Trembling Wilburys are returning to the Castle, Finchley Road on Sunday 21st of October for more great music at a great venue! Come down for all the usual hits of the Traveling Wilburys, Roy Orbison, George Harrison et al. Entry for this event is free, families are welcome and there’s a full menu.